Performers include: Majel Barrett-Roddenberry, James Doohan, DeForest Kelly, Walter Koenig, Nichelle Nichols, Leonard Nimoy, William Shatner, George Takei, and Grace Lee Whitney. Series Description: This science fiction series follows the story of the crew of the starship Enterprise as they travel on a five-year mission “to boldly go where no man has gone before.” The stories are typically a mixture of adventure and morality tales with a touch of humor. The Enterprise is led by Captain James T. Kirk (William Shatner), the half-human/half-Vulcan First Officer Mr. Spock (Leonard Nimoy), Chief medical officer Dr. Leonard McCoy (DeForest Kelley), chief engineer Montgomery Scott (James Doohan), helmsman Hikaru Sulu (George Takei), communications officer Uhura (Nichelle Nichols), and navigator Pavel Chekov (Walter Koenig). On a rescue mission, Kirk is reunited with Dr. Janice Lester, a woman with whom he was once intimately involved. In a private moment, Kirk learns that Lester has been driven mad by her frustration of being a woman in a male-dominated society. She traps Kirk in an alien device and trades minds with him. Now in Kirk’s body, she claims that her former self is insane and tried to kill her. As Kirk, she takes command of the Enterprise and even charges some of the officers with treason. Fortunately, the real Kirk (in Lester’s body) prevents her from making the change permanent and captures her. First aired: June 3, 1969. The series became even more popular in syndicated reruns and fans began to hold conventions, write fan fiction and make their own costumes and collectibles. An animated version of the show ran for 22 episodes and two seasons starting in 1973. Some of the episodes were written by writers of the series and the original cast returned to voice their characters. In 1976, a massive letter-writing campaign convinced NASA to name the first orbitting shuttle after the fictional starship Enterprise. Most of the series castmembers and series creator Gene Roddenberry attended the dedication ceremony. In 1978, Paramount started preparing to do a second television series that would reunite the original cast (with the exception of Nimoy) for a second five-year mission. With the success of Star Wars, the studio decided to make a movie instead. Star Trek: The Motion Picture featured the original cast but is quite different from the television series. It is far more cerebral in nature, downplayed the relationships of the characters, and featured lots of lumbering special effects shots. It was very expensive to make but was still a financial success. The studio okayed a second picture but with a much smaller budget. This film is much closer to the original series in style and features the return of one of the series’ most memorable “villains” — Khan Noonien Singh (played by Ricardo Montalban). Star Trek II: The Wrath of Khan also features the heroic death of Mr. Spock. This film was even more successful at the box office and the studio wanted to make another. The next film, Star Trek III: The Search for Spock, was directed by Nimoy and was similarly budgeted. The movie was also very successful and paved the way for a fourth movie (also directed by Nimoy) called Star Trek IV: The Voyage Home. The fourth film combined action with lighthearted humor, like one of the most popular episodes of the original series “The Trouble with Tribbles.” Voyage Home became the film series’ most successful installment. In 1989, Shatner took the directing reins for the fifth movie called Star Trek V: The Final Frontier. The film attempted to include some of the same elements as the previous movies but the script and special effects were lacking. It was a box-office disappointment and stalled the franchise. With the series’ 25th anniversary fast approaching, Paramount decided they wanted another Star Trek feature film for 1995. Reuniting the aging cast and Star Trek II director Nicholas Meyer, Star Trek VI: The Undiscovered Country was a moderate success at the box office and provided a proper send-off for the original cast. After the success of Star Trek IV, the spin-off series Star Trek: The Next Generation was launched in 1987 and it ran for seven successful seasons in first-run syndication. 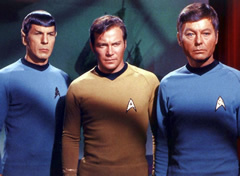 Set 80 years after the original series, some original series characters made guest appearances, including a very elderly McCoy (in the pilot), Spock, and Scott. Three other Star Trek series followed though they are technically spin-offs of Next Generation. Next Generation ended in 1994 and paved the way for films featuring that cast. Star Trek: Generations featured Kirk teaming up with Next Generation’s Captain Picard (Patrick Stewart) in the future and Kirk died heroically. Scott and Chekov also appeared in the opening of the film. A new prequel feature film, based on the original series, was released in 2009. Nimoy played a senior Mr. Spock. Barrett-Roddenberry reprised her role as the voice of the Enterprise’s computer. It was recorded shortly before her death in December 2008. Adventures of the original series characters continue to be produced in novel and comic book form. A television or movie reunion of the original crewmembers is unlikely since Kelley and Doohan have passed away, in 1999 and 2005 respectively. • The series was on the verge of cancellation after its second season but the network was convinced to renew it because of a massive letter-writing campaign. NBC moved it to a Friday night timeslot and, not surprisingly, viewership dropped even further. • John Belushi, Chevy Chase and Dan Akroyd starred in a Saturday Night Live skit about NBC’s cancellation of Star Trek. In 1986, Shatner took part in a skit where he told convention attendees to “Get a life!” Later in the same episode, he played Kirk commanding his crew as they ran a themed restaurant on the Enterprise. • Shatner co-authored a series of Star Trek books that resurrected Kirk in the Next Generation future where he was reunited with some of his old crewmates. • In September 2006, Paramount began releasing remastered versions of Star Trek episodes in which the special effects were redone to take advantage of current technology. The original versions are still available on DVD.